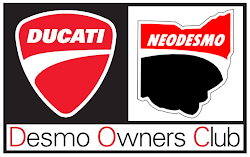 If you are on Facebook and a NEODESMO Member, check out our Facebook Group. This is a closed group, similar to our Google Group, that can also be used for posting rides to other Members. Please make arrangements to collect your 2013 Membership Kits from Ducati soon. We still have about 40 kits that we will disperse to other Members if they are not collected by April. You can use the link on our site to pay for us to ship the kit to you, or pick it up at Club Mangia or any other Club event. Also, everyone that signed up in 2013 is in the system to receive the 2014 Welcome Kit from Ducati this year. All of our new Members are added to the system as you sign up! We'll send out an email once the 2014 kits arrive.